Provide comfort for the family of James Hoffsommer with a meaningful gesture of sympathy. A Celebration of Life service for James Warden Hoffsommer, 91, of Hillsdale, Oklahoma will be held 2:00 pm Sunday, February 3, 2019 at the Hillsdale Christian School Gymnasium with Dr. Robert Courtney officiating. Burial will follow in the Hillsdale Cemetery under the direction of Ladusau-Evans Funeral Home. The family will receive friends from 5:00 pm to 6:00 pm Saturday at the funeral home. James went home to be with the Lord on January 31, 2019 after a short stay at the Golden Oaks nursing home. James was born June 8, 1927 to Harley E. Hoffsommer and Mildred B. (Liming) Hoffsommer. 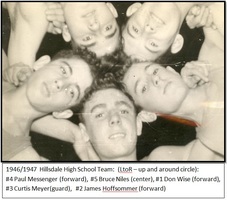 He lived in the Hillsdale community most of his life. 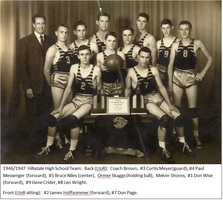 He was born and raised on a farm near Hillsdale, attended school there, graduating from Hillsdale High School in 1945. Following his service in the United States Navy during WWII (Pacific Theatre, 1945-1946), he returned to Hillsdale, where he married Norma Jean Wayman in 1948, and together they began their family. James and Jean purchased a farm and home west of Hillsdale. James lived in that home for over 70 years. James is survived by four of his children, daughter Trudy Hoffsommer, and three sons, Monty and wife Anita, Steve and wife Brenda , Dr. Jeff Hoffsommer and wife Sue, brother in law Kent (Patti) Wayman, and sister in law Patsy Wayman. James leaves behind many additional family members who will miss him dearly. At the time of his death, he was grandfather to 12 grandchildren and 26 great-grandchildren. He was preceded in death by his wife of 64 years, Norma Jean (Wayman) Hoffsommer, and one child, Susan Hoffsommer, who died in infancy. James earned a B.S. Degree in Education at Phillips University in 1957, an M.S. Degree in Education at Phillips University in 1970, and he was a graduate of the National Rural Development Leaders School in Boulder Colorado. He was a farmer/rancher for fifty-eight years, producing wheat and beef. In the later portion of his career, he served as a Field Agent for the Oklahoma Tax Commission. Concurrent with most of his farming operation, he was an educator, seventeen years as a classroom teacher, and as Principal of Hillsdale High School and of Kremlin-Hillsdale Middle School. He was founder and President of the Board of the Hillsdale Christian School beginning in 1982, and he continued to serve as an Administrator for many years. James was a member of the Hillsdale Bible Church (previously Hillsdale Congregational Church) for over 74 years where he served in the capacity of Deacon and Board Chairman for several terms. He was also an adult Sunday school teacher for over 45 years. James was heavily involved in civic and political activities throughout his career. He ran unsuccessfully for State Senator in 1970, but that loss did not stop him and perhaps even strengthened his resolve to serve his community and fellow countrymen. The following is a list of the various areas of civic service he was involved with: Garfield County Conservation District, Garfield County Rural Development Association, Garfield County Mineral Owner’s Association, U.S. Senator Don Nickels’ Agriculture Advisor Committee, U.S. Senator Dewey Bartlett’s Task Force on Rural Development, Farm Consultant to President Gerald Ford, 1976 Campaign, Garfield County ASCS Committee, Garfield County Education Association, Garfield County School Masters Association, Oklahoma Education Association Executive Board, Oklahoma Department of Education Textbook Committee, Garfield County Republican Party, Coordinator of President Richard Nixon visit to Vance Air Force Base and Oklahoma State University, Vice-President Nelson Rockefeller visit to Enid, Hillsdale Community Booster Club, Enid-Garfield County Library Board, Member, Garfield County Industrial Authority, Member, Garfield County Excise/Equalization Board, and the Recipient of Enid Chamber of Commerce Agricultural Hall of Fame Award. The children of James and Jean Hoffsommer observed a lifetime of love and compassion that both of them joyfully showered upon their family, friends and neighbors, manifested in numerous acts of sacrificial giving of time and energy. Yet all the acts of service and sacrifice for others was not enough to allow him to live forever. As a sinner himself, like all the rest of us, he knew that he had no hope of eternal life without the resurrection power that comes from the work of Jesus Christ, who loved the world and gave his life to pay the penalty for our sin. James was a beneficiary of this grace, and he wanted those he knew to experience that same salvation. He shared his faith openly with others and one of his favorite verses of scripture was “For our sake He made Him to be sin Who knew no sin, so that in Him we might become the righteousness of God” 2 Corinthians 5:21. The prayer of the Hoffsommer family is that others who knew James but have not come to know James’ Savior, will desire the freedom that comes from knowing their eternal existence is secured…that death is not the end but the beginning, for those who put their trust in Jesus Christ, the Author and Finisher of salvation. “O death, where is your victory? O death, where is your sting?” “Thanks be to God who gives us the victory through our Lord Jesus Christ.” James has begun the next phase of his existence, eternal life in heaven in the presence of God and the Lord Jesus Christ. We look forward to the day we will be reunited. The Hoffsommer family would like to thank the wonderful staff of Golden Oaks and Valir Hospice for the outstanding care they provided to James. Memorials may be made to Hillsdale Christian School, Building Fund with Ladusau-Evans Funeral Home serving as custodians of the fund. Condolence may be made online and the service may be viewed online at www.ladusauevans.com. To send flowers in memory of James W Hoffsommer (Hoffsommer), please visit our Heartfelt Sympathies Store. Provide comfort for the family of James W Hoffsommer (Hoffsommer) by sending flowers. I had the privilege to get to know James when he and my father, Bob Jessup made a lot of cattle deals in the 1980s and early 90s before Bob passed in 1993. Being the son of a cattle buyer I got to meet several farmers and cattlemen across the state. Coming to Hillsdale on a business transaction has always been my favorite because of the loving warmth that James and Norma Jean expressed to me over the years. James was one of the few good friends Bob had on a personal level. They shared a kindred spirit. And to get to experience Norma Jeans cooking after weighing cattle trucks was a double blessing! James and Bob can once again be at a cattle auction together at that heavenly auction barn! Thank you James for the blessed memories and the legacy you have left!